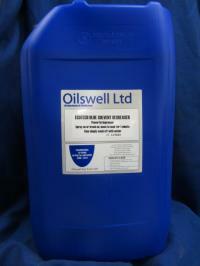 Ecotech Degreaser is a blue coloured, low viscosity solvent cleaner with powerful degreasing properties. It is manufactured from a blend of hydrocarbon solvent and non-ionic emulsifiers, which provide a self-separating emulsion. It can be emulsified with water and may be either rinsed away or wiped off. It is suitable for most degreasing purposes, can be applied by brushing, wiping, low-pressure spray or by soaking in a tank. It should then be wiped, allowed to drain or rinsed away with clean water. It is suitable for use on metal, concrete, tiled or painted surfaces. It is not suitable for asphalt or bitumen surfaces.